Why are 3.5X6 Magnets Sweeter than the Christmas Morning? 3.5 x 6magnets and Christmas morning sound like chalk and cheese but they do evoke comparisons due to their specialty. A Christmas morning is the most pleasant day of the year because family members huddle over a table to enjoy a lavish breakfast after the mid night meal and it is one of the treasured traditions in many US homes. Similarly, 3.5 x 6 magnets are becoming part of the treasured advertising strategy. Being large, they are sought for printing various individual and promotional messages. Here are certain personalized magnets printed over 6×3.5 magnets, which make you feel as if every morning is a Christmas Day. These custom magnets are perfect for any type of announcements such as a birthday, retirement, greeting, relocations/moving, reunions, gathering, special events, grand openings, and more. Announcement calendar magnets can be bulk mailed or gifted during tradeshows or other promotional events. People would be elated to see a personalized magnet smiling at them from over their refrigerator door. 4th of July magnets 3.5 x 6 may stir patriotic pride in all those who see it every day. A patriotic magnet becomes a real mood and stress buster on all days. Perfect for gifting during July 4 or other days of national interest. Supplying a healthy dose of sports information is the perfect way to touch chords with many Americans because they are known for love for sports. 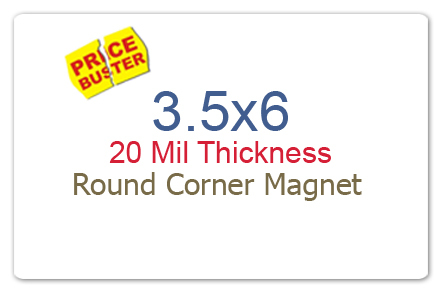 You can easily employ customized 3.5×6 sports schedule magnets at your service. Promotional postcard magnets are becoming a popular choice for marketers who wish to get nearer to their customers in a very effective way. They know with these customized magnets, each day will be the Christmas Day for their brand. People would love to retain these customized magnets over their refrigerator door as long as they can. This long-term visibility will definitely bring long-term business benefits to marketers who believe in smart advertising through magnet advertising. Any small school token is the thing of pride, isn’t it? Students, parents, teachers, and everyone else would love to retain a school memorabilia. No wonder many PTA associations are investing in full color school calendar magnets for fundraising. Whoa! The holiday is here and the memories are going to remain forever. 3.5 x 6 holiday magnets are becoming a favored gifting choice for many marketers and individuals because they are largely affordable and they help to warm up relationships. Holiday is a treasured keyword because it is painted with that feeling of warmth and relaxation. Holiday magnets rub that feeling of relaxation and it makes a viewer feel as if each day is a holiday. Religious calendar magnets become a value addition or asset to the religious atmosphere in the home. People always love to retain such personalized magnets over visible spaces within the home. They would always see it and think about their spiritual and religious responsibilities. These custom magnets are perfect for religious organizations, prayer groups and many others who wish to generate religious awareness. You can easily personalize 3.5 x 6 magnets with information, which rubs that everyday is the Christmas feeling on a viewer!